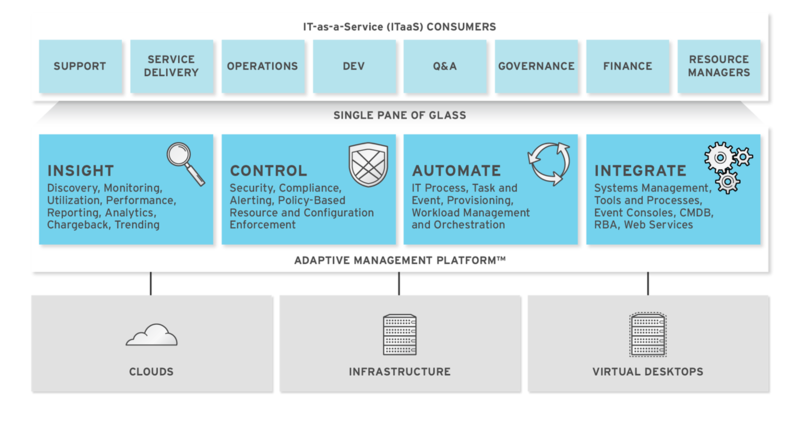 Red Hat CloudForms delivers the insight, control, and automation that enterprises need to address the challenges of managing virtual environments. This technology enables enterprises with existing virtual infrastructures to improve visibility and control, and those starting virtualization deployments to build and operate a well-managed virtual infrastructure. Insight: Discovery, Monitoring, Utilization, Performance, Reporting, Analytic, Chargeback, and Trending. Control: Security, Compliance, Alerting, and Policy-Based Resource, and Configuration Enforcement. Automate: IT Process, Task and Event, Provisioning, and Workload Management and Orchestration. Integrate: Systems Management, Tools and Processes, Event Consoles, Configuration Management Database (CMDB), Role-based Administration (RBA), and Web Services. The diagram below describes the capabilities of Red Hat CloudForms. Its features are designed to work together to provide robust management and maintenance of your virtual infrastructure. The Red Hat CloudForms appliance (appliance) which is supplied as a secure, high-performance, preconfigured virtual machine. It provides support for HTTPS communications. The Red Hat CloudForms Server (Server) resides on the appliance. It is the software layer that communicates between the SmartProxy and the Virtual Management Database. It includes support for HTTPS communications. The Virtual Management Database (VMDB) resides either on the appliance or another computer accessible to the appliance. It is the definitive source of intelligence collected about your Virtual Infrastructure. It also holds status information regarding appliance tasks. The Red Hat CloudForms Console (Console) is the Web interface used to view and control the Server and appliance. It is consumed through Web 2.0 mash-ups and web services (WS Management) interfaces. The SmartProxy can reside on the appliance or on an ESX Server. If not embedded in the Server, the SmartProxy can be deployed from the appliance. A SmartProxy agent must configured in each storage location, and must be visible to the appliance. The SmartProxy acts on behalf of the appliance communicating with it over HTTPS on standard port 443. To use Red Hat CloudForms, certain virtual hardware, database, and browser requirements must be met in your environment. Virtual Machine Count: the most important factor in the calculation of virtual machine database (VMDB) size over time. Host Count: the number of hosts associated with the provider. Storage Count: the number of individual storage elements as seen from the perspective of the provider or host. It is not the total number of virtual disks for all virtual machines. A monitor with minimum resolution of 1280x1024. Due to browser limitations, Red Hat supports logging in to only one tab for each multi-tabbed browser. Console settings are saved for the active tab only. For the same reason, Red Hat CloudForms does not guarantee that the browser’s Back button will produce the desired results. Red Hat recommends using the breadcrumbs provided in the Console. The Red Hat CloudForms appliance must already be installed and activated in your enterprise environment. The SmartProxy must have visibility to the virtual machines and cloud instances that you want to control. The resources that you want to control must have a SmartProxy associated with them. The following terms are used throughout this document. Review them before proceeding. The level of access a user has to different parts and functions of the Red Hat CloudForms console. There are a variety of Account Roles, which can be assigned to users to restrict or allow access to parts of the console and virtual infrastructure. A virtual machine where the virtual management database (VMDB) and Red Hat CloudForms reside. A control policy test triggered by an event, which determines a subsequent action. A computer running a hypervisor, capable of hosting and monitoring virtual machines. Supported hypervisors include RHEV-H, VMware ESX hosts, Windows Hyper-V hosts. The SmartProxy can be configured to reside on the Red Hat CloudForms appliance or on an ESX server version. The SmartProxy can be deployed from the Red Hat CloudForms appliance, and provides visibility to the VMFS storage. Each storage location must have a SmartProxy with visibility to it. The SmartProxy acts on behalf of the Red Hat CloudForms appliance. If the SmartProxy is not embedded in the Red Hat CloudForms server, it communicates with the Red Hat CloudForms appliance over HTTPS on standard port 443. An image in the web interface representing a resource, such as a provider or a virtual machine, showing the resource’s properties at a glance. Each virtual thumbnail is divided into quadrants, which provide information about the resource, such as its software and power state.